One of the most common things you’ll read about when researching frugality or saving money is the latte factor. In fact, just a few days ago, LifeHacker published this article about it. The basic premise is that if you’re spending $4 every day of the year on a latte, that actually adds up to a reasonably large $1460 every year. If you were to save that money, you’d suddenly see a huge jump in your savings and therefore, a quicker path toward your financial goals. Of course, it doesn’t just work for lattes. It can be used to save money and figure out the true cost of all those “little” purchases. Magazines. Snacks from the machine at work. Anything that when purchasing you think “oh, it’s only a few dollars.” The problem is, those few dollars add up to a lot of money over time. 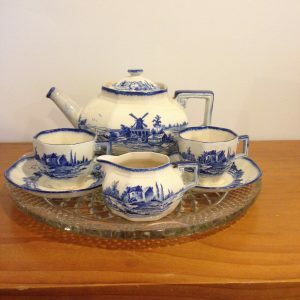 My antique tea set I bought before I knew what frugality was. For Poopsie and I, we have conquered the literal latte factor fairly easily. I myself am an avid tea drinker. I like my tea very milky and quite sweet, and I am yet to purchase a cup of tea at a cafe or restaurant who was able to get it just the way I liked it. Thus the problem was solved for me- since it wouldn’t taste how I wanted it to taste, it made no sense for me to purchase a cup of tea from anywhere. Instead, I make it at home and bring it with me, or at work, I bring all of my own tea making supplies to the office with me. This saves me an enormous amount of money. I do enjoy the occasional latte though. A few years ago, before I met Poopsie, a friend of mine bought a Nespresso Coffee Machine. I was extremely impressed with the latte she was able to make me- I thought it was cafe standard. But at around $450 (at the time), I was not willing to spend the money as I only had one or two coffees a week. I did really want one though, so I decided on a price I was willing to pay for a machine, which was $100. I then started monitoring online classifieds and Ebay. I looked in my area, the area my parents lived in and the area my brother lived in. It took almost two years, but eventually a lady who had to give up coffee for medical reasons was selling her almost brand new machine and milk frother for $100. I bought it immediately. My trusty machine, bought for the right price. Sure, it was a colour that I wouldn’t have chosen myself, but the price was right. I have been enjoying lattes from the machine for a few years now and have no regrets with my purchase. I do have to buy pods for it, but at roughly 70 cents a cup, I still prefer the price of this to purchasing a latte at a cafe. Poopsie is an avid coffee drinker. While he could use the Nespresso machine at home, it would have been quite the hassle for him to lug it to work each day. This amazing contraption apparently makes excellent black coffee. We purchase the beans from Aldi and Poopsie makes two delicious coffees everyday at work. Instead of having his first coffee of the day at home and using a comparatively expensive pod, he waits until he gets to work to use the cheaper Aeropress. 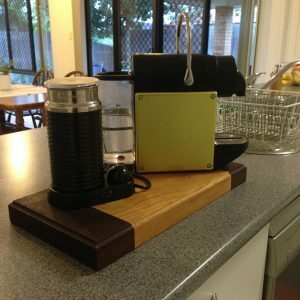 He has actually come to prefer the Aeropress to either the Nespresso machine or a cafe. I think the Aeropress cost him about $25 and he has more than made his money back from it. He highly recommends this device to anyone who loves a black coffee. This is how we manage the literal latte factor. We don’t want to miss out on two things we really enjoy: tea and coffee. So instead, we’ve created ways to enjoy them that don’t cost very much money and don’t mean we’re spending time in cafes, tempted by all the other things they sell. How do you manage the latte factor in your life?